Bread, but make it fashion. Burgers need no introduction. The universal knowledge that great things happen when you disguise salad as a sandwich on steroids could be acknowledged by an infant, and it’s no surprise that we go gaga over something so juicy, sky-high and brioche-fuelled. Let’s not pretend that the rich and famous wouldn’t opt for a burger in a fine dining establishment given the choice, with mouth-watering proof spread across some of Brisbane’s finest menus (we see you, fancy burgers). Here’s one for our gourmand/gourmet hybrids. James Street is the place to be for all things extra, and Gerard’s Bar is no exception. Lay down a napkin and raise a pinkie as you elegantly tuck into the GBar cheese burger, perfectly constructed with Blackmore wagyu, relish, mustard, butter lettuce and American cheese on a delicate milk bun. That’s Iggy level fancy. Less mystery fish, more flounder. 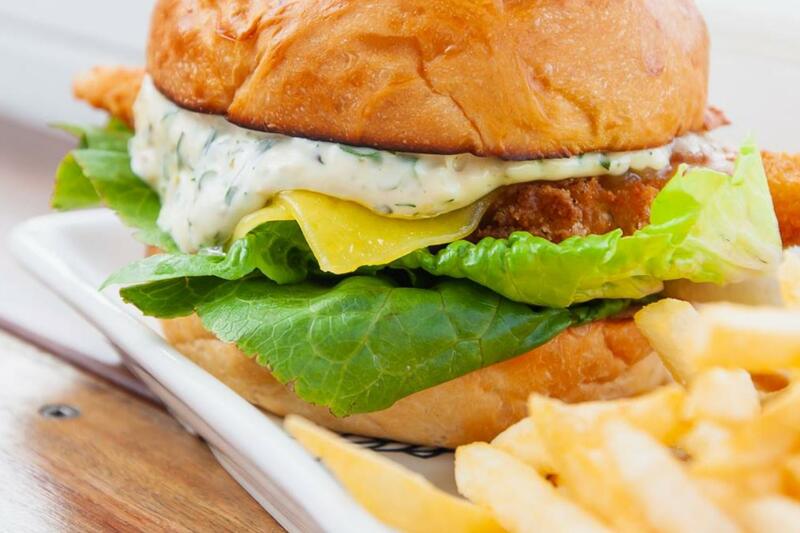 One Fish Two Fish’s cheeky panko-crumbed Quarter Flounder burger is dripping in finesse. Other ingredients include lettuce, cheese house-made tartare (but of course) and fries on the side. Lush fish, bish. How now grass-fed cow. Stokebar Q is serving serious riverside views with a side of exquisite burgs. Wait for someone to pull out your chair before you’re seated in front of a juicy grass-fed beef burger, with perfectly placed pickles, mustard, iceberg lettuce, and cheese. Yes please. Every ingredient is made in house, but you better believe its not on the house (show some decorum). Nota’s tempura monkfish sandwich is made on house-made brioche with house tartare and mustard cress (say house again), creating a beautiful bite-sized slider for the fancy fish fiend. *add fancy burger to kart* Billykart Bar has not one, but six slick burger options to soothe your hanger after the Premium Uber was late. Choose from an excellent cheese burger, fried chicken, veggie, cuban, brisket or fish with nothing less than spectacular sauces and salads appropriately paired with each protein. Plus, if you’re feeling fancy on a dollar store budget, head over on Wednesdays for 2-4-1 deals from 5:30pm! Adding an oriental twist on your humble western burg, hôntô’s karaage chicken roll is one to watch (and eat). Served on a soft milk bun, the chicky roll incorporates karashi mayo, baby gem lettuce and mustard greens to leave you with heaven on a roll.